Bolt d’Oro. 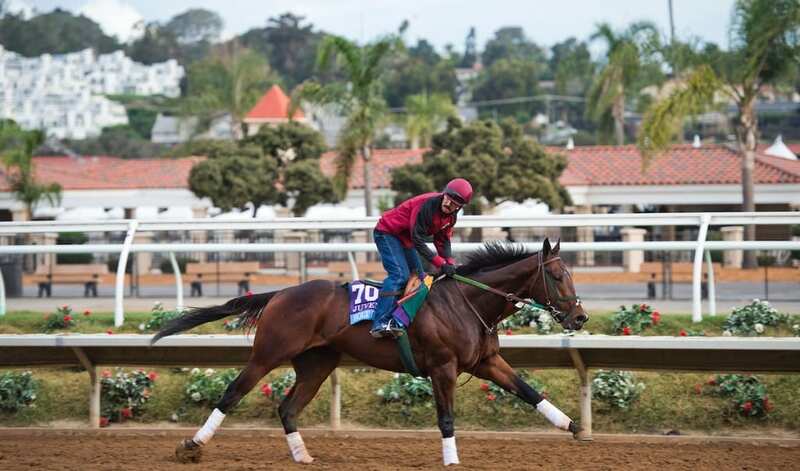 Photo by Anna Purdy/Eclipse Sportswire/Breeders Cup. Owner/trainer Mick Ruis confirmed Thursday that Bolt d’Oro is a candidate for the May 19 Preakness Stakes (G1) at Pimlico Race Course. Bolt d’Oro, who finished 12th behind victorious Justify in Saturday’s Kentucky Derby (G1) over a sloppy Churchill Downs track, galloped a mile and a half at Keeneland in Lexington, Ky. Thursday morning. Bolt d’Oro, who had finished second behind Justify in the April 7 Santa Anita Derby (G1), chased the pace outside the undefeated Bob Baffert trainee before starting to tire on the turn into the homestretch. Ruis received visual evidence that the son of Medaglia d’Oro’s first off-the-board finish was the result of a dislike for the sloppy, sealed racetrack. Ruis said Bolt d’Oro won’t run in the Preakness if the Pimlico track comes up muddy or sloppy for the 143rd edition of the Middle Jewel of the Triple Crown. Ruis, who purchased a 169-acre farm in Woodford County in Kentucky prior to the Kentucky Derby, reported that Bolt d’Oro has recovered nicely from his subpar performance.